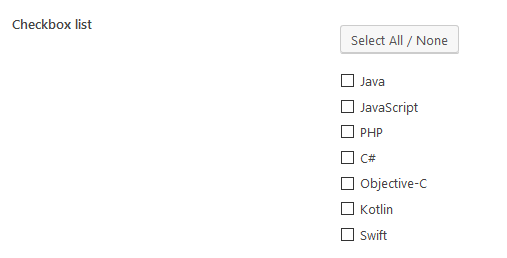 The checkbox list field creates a list of tick-able checkboxes. You are able to select multiple choices from the predefined list. options Array of 'value' => 'Label' pairs. value is stored in the custom field. Required. inline Display choices in a single line? true or false. Default false. select_all_none Display “Select All / None” button to fast toggle choices. // Display options in a single row? // Display "Select All / None" button? This field saves multiple values in the database. Each value is store in a single row in the database with the same meta key (similar to what add_post_meta does with last parameter false). If the field is cloneable, then the value is stored as a serialized array in a single row in the database.